<Extremely Movie Trailer Voice> IN A WORLD where the names of disabled Mets are more prestigious than those still on the active roster </>, you’d expect to long ago (or at least two weeks ago) feel like injuries decimated the team’s playoff chances. Instead, entering Sunday’s slate of games, BP’s playoff odds page gave the Mets a near-two-thirds chance to reach the Coin Flip Game ($1, Joe Sheehan). No matter what happens the rest of the way, 2016 won’t go down as an utter disaster. Except that Michael Conforto is a mess. Terry Collins transmogrified the 10th pick in the 2014 draft — a guy who raked to a .315 TAv as a 22-year-old rookie, who’d never posted a TAv lower than .292 at any level, who had hit .333 with two dingers in five World Series games — into a nonentity against left-handed pitching (.106/.157/.128) and an Adam Dunn-like three true outcomes hitter (.237/.327/.466) when Terry deigned to start him against northpaws. The catching position is a wasteland for the Mets right now. Travis d’Arnaud Year 2: Electric Boogaloo has been an utter disappointment. Rene Rivera is a backup at best; his slightly-higher TAv in comparison to d’Arnaud (.254 to .243) only underscores the latter’s struggles. Kevin Plawecki is Kevin Plawecki. 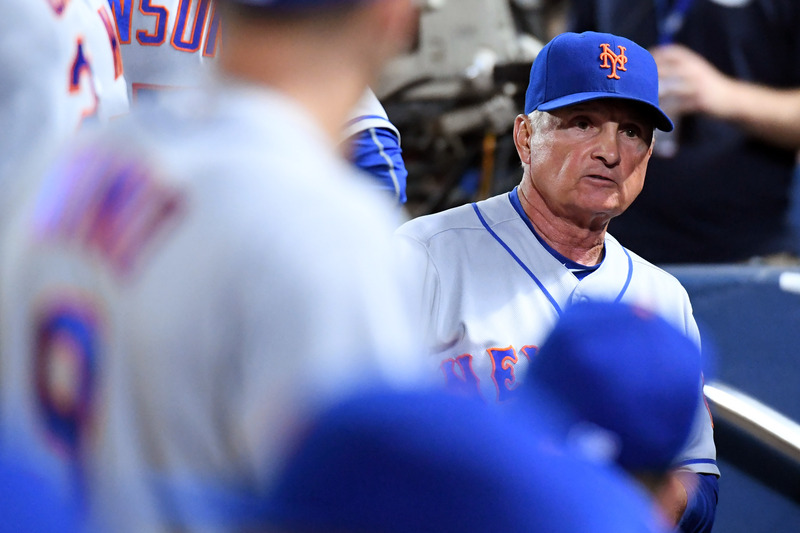 In the darkness, Terry Collins needs a veteran to step up to guide this pitching staff. A veteran who is also not going to hit, but brings with him the kind of stabilizing presence behind the plate that (almost) guided the team with the best pitcher in baseball to the World Series (once). The Mets’ midseason pickup of James Loney was always a reasonable gamble, but in the middle of a dogfight for a Wild Card spot, it’s tough to man an offense-first position with the literal embodiment of “replacement player.” Terry Collins reluctantly pencils Loney in every day because Wilmer Flores stole Terry’s sandwich from the employee refrigerator and must pay the price. Following Neil Walker’s season-ending back surgery, the Mets no longer have a bona fide starting second baseman on their roster. That role currently belongs to a strange combination of Wilmer Flores, Kelly Johnson and Matt Reynolds. These circumstances should provide a chance to see what Gavin Cecchini can do in the big leagues. However, Terry Collins would much rather go with the veteran presence of Brandon Phillips, the 35-year-old second baseman for the Cincinnati Reds instead of risking the season and potentially his job on his current options.